Being able to work with limited gear, completing an extra careful set up on deck and, of course, keeping a firm grip on the camera, were just some things Tim needed to consider on both shoots. Ken Moffat, Executive Producer at Loulaki Blue, has worked with Tim on many projects for over 10 years and he recognises the skills needed to successfully pull off a shoot on water. There are also inherent dangers to be constantly aware of, including a swinging boom and choppy conditions. Add to this the rapidly changing weather conditions, not to mention the need to become invisible when the drones were operating overhead to capture the aerial shots, and it has the potential to be a stressful and difficult shoot. 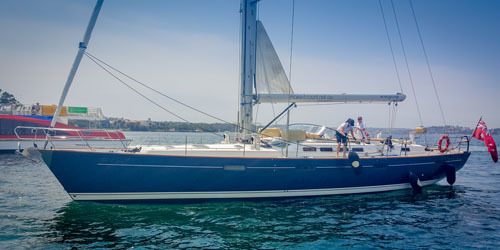 Tim has recently been working with Ken and the Loulaki Blue crew for CCB (Chinese Construction Bank), which has sponsored the charter yacht “The Count” by purchasing the sails – one of the most expensive parts of such a vessel. This magnificent boat is the main drawcard of the ‘Make it Count’ charter yacht business, which enables guests to experience a day of luxury life on board the yacht. 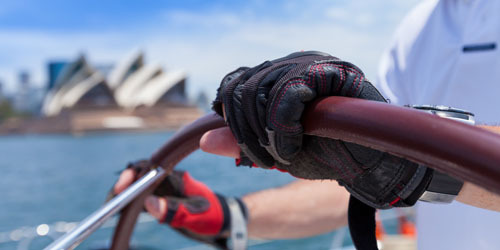 The goal of this two-day shoot was to showcase the boat and all it has to offer, and it involved shooting both stills and video of the yacht while it was sailing around the harbour, past some of the iconic landmarks such as the Sydney Harbour Bridge and Opera House as well as the CCB offices. “Tim also had the responsibility of being the stills photographer on the shoot, meaning he was shifting between stills and video,” says Ken, who was located on the shore for the shoot, overseeing the drone. 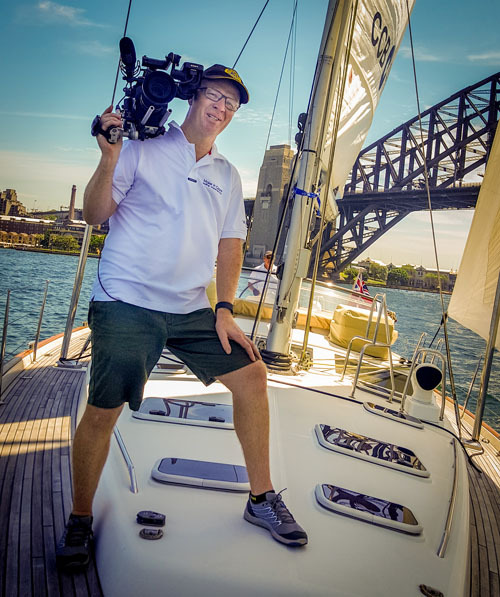 “This was executed really well, and independently – I needed Tim to be on-board a yacht on the harbour, to take footage and get all the appropriate shots, without having a director with him. No complaints from him and he provided fantastic, action-packed footage. And the CCB shoot isn’t the only occasion Tim has been out on the water lately. 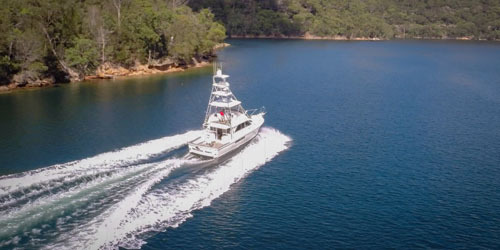 He also undertook a shoot for Smart Surfaces Marine, with filming taking place primarily on a game-fishing boat out on Sydney’s beautiful Pittwater. Smart Surfaces Marine has recently developed a clever new product, and Minds Eye was tasked with highlighting the advantages of this new energy efficient and ecological antifouling agent. Tim shot a series of speed and fuel consumption tests from on-board the boat, in addition to a speed boat, which enabled him to capture the many angles of the boat. This was shot using both his Sony F5 camera and a couple of GoPro cameras. A drone was also used to capture some beautiful scenic shots. After a few days of testing, the new product showed it was capable of saving boat users up to 20% on fuel costs and increasing a boat’s top speed! And after both shoots, Tim managed to stop swaying when he got back on to land. He’s looking forward to the next time he does a shoot aboard a boat.